CSU, Chico is committed to the professional and educational development of teachers. The School of Education actively participates in meeting the lifelong learning needs of educators in our region. Continuing Education supports that commitment with an array of academic and professional development courses and workshops. The Liberal Studies Online Option is a degree completion program for students who plan on teaching elementary school or desire a broad-based degree. Upon completion of our program you will have a Bachelor of Arts degree. The MS in Mathematics Education  is a 30-unit summer program that provides an opportunity for secondary mathematics teachers to advance their professional development by deepening and broadening their understanding of mathematics and of mathematics education; developing their understanding of mathematics education research and its relationship to practice; and developing their skills as teacher leaders in mathematics education. The National Art Education Association and CSU, Chico Regional & Continuing Education have partnered to offer NAEA members university credit for participating in a variety of NAEA conferences, workshops, webinars, and other activities. Each 15 hours completed of NAEA professional development can be accrued for 1 semester unit. 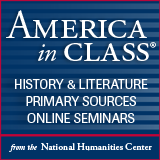 Through a partnership with the California National Humanities Center Department of Education, the National Humanities Center  (NHC) is pleased to offer California educators free registration in a series of live, online professional development seminars for history, literature, and humanities teachers. The CSU, Chico School of Education  promotes passion for learning, respect for the individual, and service to society. Collaborating with K-14 educators and University partners, the department prepares professional educators to improve the quality of life through education. The School of Education provides information on everything you need to know about the different kinds of credentials available at CSU, Chico, their prerequisites and requirements, how to apply for a program, and other information. The TEACH California web site  is designed to recruit teachers to the profession of teaching, explain the teacher preparation process, assist prospective teachers in creating their plan to become credentialed teachers, provide relevant content, partner with related public and non-profit entities, and offer links to important resources. 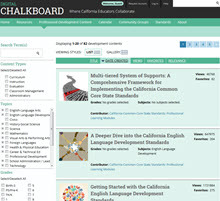 Digital Chalkboard  is an online community of California public school and district educators. California educators collaborate through group participation and discussions, upload educational classroom and administrative resources that help other educators access what works best in California schools and districts. As of the summer of 2014, over 70,000 educational resources have been contributed to the resource libraries. Both featured content providers from select non-profit organizations and approximately 19,000 California educators continue to contribute resources and collaborate.